THE GRADUATED PATH TO LIBERATION | BUDDHA IN THE MUD by Tony Barrs. There are two truths: the real and the seemingly real. Their connection is the negative emotions. On the path of the seemingly real, the emotions imprison us. On the path of the real, the emotions liberate us. There is a secret life to the emotions. There are comprehensive explanations of the Stages of Calm Abiding online: this is an extract from ‘The Graduated Path to Liberation’ by Geshe Rabten. The image is a pictorial representation of a person who is following the path of meditative stages, ending in the accomplishment of calm abiding and the beginning of the practice of insight meditation. Once the mind is calm and controlled, then it can do great work, investigating itself. “At the bottom of the page, we see the practitioner who holds a rope in one hand, and a hook in the other, chasing after an elephant led by a monkey. The elephant represents the meditative mind; a wild and untrained elephant can be dangerous and wreak enormous destruction but once an elephant is trained, it will obey commands and do hard work. The same holds true for the mind. Any suffering that we have now is due to the mind being like a wild, untamed elephant. The elephant also has very big footprints; these symbolise the mental defilements. If we work hard to improve our mind, it will be able to do great work for us in return. From the suffering of the hells to the happiness of the Buddhas, all states are caused by the behaviour of the mind. “At the start of the path, the elephant is black, representing torpor, or sinking of the mind. 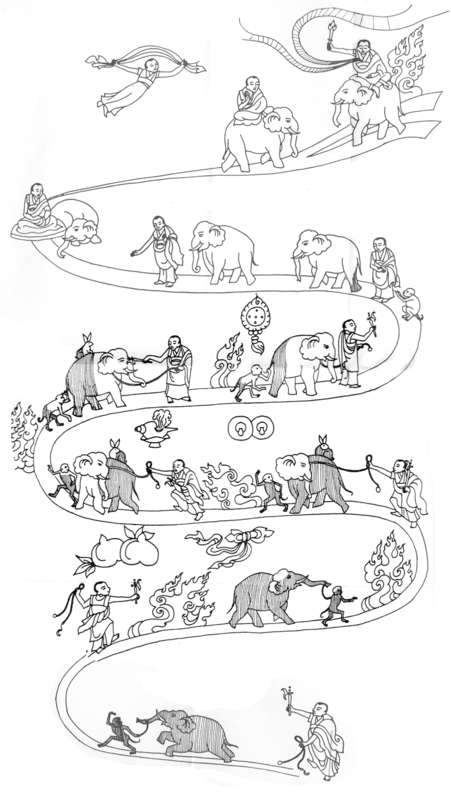 The monkey, who is leading the elephant, represents scattering of the mind. The monkey cannot keep quiet for a moment – it is always chattering or fiddling with something, and finds everything attractive. In the same way that the monkey is in front, leading the elephant, our attention is scattered after the sense objects of taste, touch, sound, smell and vision. These are symbolised by food, cloth, musical instruments, perfume and a mirror. This entry was posted in Uncategorized and tagged calm abiding-Shamata meditation., The Gradual Path to Liberation by Geshe Rabten.. Bookmark the permalink. 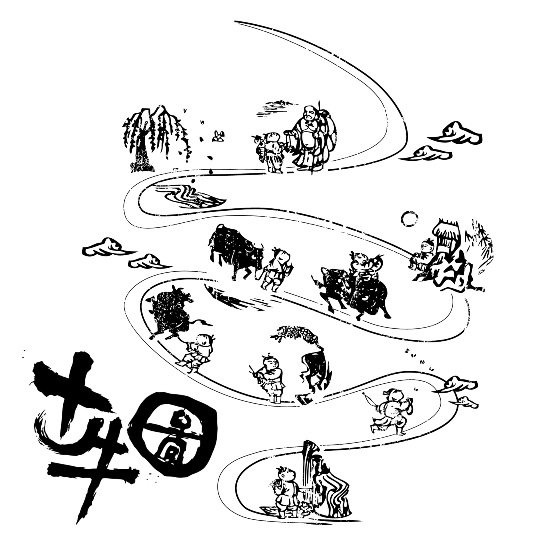 Another representation of the path of liberation with and eventual returning to the world as the expression of compassion are the so-called oxherding pictures from the zen tradition. “The ten oxherding pictures, a well-known Zen representation of training of the mind, are so basic that it could be considered fundamental to all schools of Buddhism. A deeper way of looking at it is in terms of spiritual development from Shravakayana to Maha Ati. In the Tibetan tradition there is an analogy of elephant herding but it refers largely only to the practice of shamatha. The symbolism does not go beyond the riding of the elephant. In the oxherding pictures the evolutionary process of taming the bull is very close to the Vajrayana view of the transmutation of energy. Particularly returning to the world as the expression of the compassion of the Nirmanakaya shows that the final realization of Zen automatically leads to the wisdom of Maha Ati. The inspiration for this first step, which is searching for the bull, is feeling that things are not wholesome, something is lacking. That feeling of loss produces pain. You are looking for whatever it is that will make the situation right. You discover that ego’s attempt to create an ideal environment is unsatisfactory. By understanding the origin you find the possibility of transcending this pain. This is the perception of the Four Noble Truths. You see that pain results from the conflicts created by ego and discover the footprints of the bull, which are the heavy marks of ego in all play of events. You are inspired by unmistakable and logical conclusions rather than by blind faith. This corresponds to the Shravakayana and Pratyekabuddhayana paths. You are startled at perceiving the bull and then, because there is no longer any mystery, you wonder if it is really there; you perceive its insubstantial quality. When you begin to accept this perception of non-duality, you relax, because you no longer have to defend the existence of your ego. Then you can afford to be open and generous. You begin to see another way of dealing with your projections and that is joy in itself, the first spiritual level of the attainment of the Bodhisattva. Seeing a glimpse of the bull, you find that generosity and discipline are not enough in dealing with your projections, because you have yet to completely transcend aggression. You have to acknowledge the precision of skilful means and the simplicity of seeing things as they are, as connected to fully developed compassion. The subjugation of aggression cannot be exercised in a dualistic framework – complete commitment into the compassionate path of the Bodhisattva is required, which is the development of patience and energy. Once caught, the taming of the bull is achieved by the precision of meditative panoramic awareness and the sharp whip of transcendent knowledge. The Bodhisattva has accomplished the transcendent acts (paramitas) – not dwelling on anything. There is no longer any question of search. The bull (mind) finally obeys the master and becomes creative activity. This is the breakthrough to the state of enlightenment – the Vajra-like samadhi of the Eleventh Bhumi. With the unfolding of the experience of Mahamudra, the luminosity and colour of the mandala become the music which leads the bull home. Even that joy and colour becomes irrelevant. The Mahamudra mandala of symbols and energies dissolves into Maha Ati through the total absence of the idea of experience. There is no more bull. The crazy wisdom has become more and more apparent and you totally abandon the ambition to manipulate. This is the absence of both striving and non-striving. It is the naked image of the primordial Buddha principle. This entrance into the Dharmakaya is the perfection of non-watching – there is no more criteria and the understanding of Maha Ati as the last stage is completely transcended. Since there is already such space and openness and the total absence of fear, the play of the wisdoms is a natural process. The source of energy which need not be sought is there; it is that you are rich rather than being enriched by something else. Because there is basic warmth as well as basic space, the Buddha activity of compassion is alive and so all communication is creative. It is the source in the sense of being an inexhaustible treasury of Buddha activity. This is, then, the Sambhogakaya. “Life is suffering, but there is a way out” the noble thruthsof buddhism… “Tame the mind, do good, don’t harm”, “not too loose, not to tight” was the way teached by the buddha to end suffering. Very much so, he knew what he was talking about. Practice, meditate and work on the body, speech, mind is a hell of job. It takes time to clean and calm the system. Taming the mind is key, while the distracted mind is easy prey for the devil hiding in ambush. Not an easy task to arrive at 6 rigpa paramitas. As presented in the picture of the path, we see lot’s of fire on the road which need to be transcendent. The moment you walk through the fire you find out that the fire wasn’t there at all. Most of the time we are finding ourselves on our way..
“The only person who can save us is ourselves.